It’s really hard to put into words day one of the End Youth Homeless Conference. Sometimes I feel like a stranger from another planet when I speak, but in this conference I’ve been at home. Everything connects. What a day. From the moment we were treated to the wonderful greeting from Uncle Les, it’s been a moving, innovative roller-coaster of voices and ideas. I particularly loved the idea of being introduced by a comedian, which gave me the perfect excuse to try out a few well received jokes of my own about the weather (how English of me) and the way politicians in videos manage to talk while smiling. Open Talent will be a comedy show one day, so watch out disadvantaged thinking, we are coming to get you! I was really moved by the two young people who came up to talk to me afterwards, who totally got it. Bright and passionate individuals – they are the future talent makers. I loved the tweet from one of them saying ‘even as a young person I’ve underestimated young people’. I also found out from someone in the audience from Middlesbrough that Cook the explorer started out as a farm labourer before his own talent was spotted. Just glad that that no Maslow fans didn’t try to mug me afterwards. Maybe a bit naughty of me to orchestrate the audience to say out load, ‘say no to Maslow’, but I think they enjoyed freeing the yoke. Following my workshop (the advantaged thinking exercise created a great buzz, as did the video when it finally played) I enjoyed an excellent presentation from Virgin’s ‘Champion’ Bee Orsini. Amazing speaker – hope we can get her to the UK to link up with our UK Champions. I’ve met so many passionate people today, the opportunities to create a new community of practice here are mind blowing. 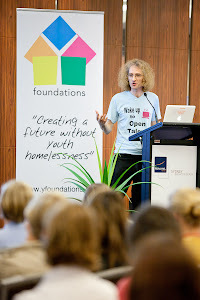 Australia’s got the talent – thanks to YFoundations for bringing it together. Now we just need to harness the energy with some advantaged thinking.